Do you have too many dishes in the sink, not have very much food in your house, and feel lazy? If so, this is what you should have for dinner. Our dishwasher is broken and we're having some technical difficulties. This dinner only needs a roaster/cookie sheet, which can be covered in foil so you don't have to wash it, a cutting board, knife, spoon, a little cup, and a small pot. I guess that's more than I thought. Anyway, this is fairly healthy as far as things we eat in my house go, cheap, and good. Turn on the oven to 400 degrees. Cut the sprouts in half and trim off their bottoms. Spread them in your pan, and drizzle with olive oil, then sprinkle with salt and pepper. Roast for about half an hour, until the sprouts are fork-tender and well browned. Sprinkle with cheese while hot. Bring a pot of water to boil (about 2 inches deep), and add the vinegar. Break an egg into a little bowl, and all at once drop the egg into the hot water, turn off the heat, and sweep the egg white strands around a little bit back onto the egg so it stays together. Cover the pot and let sit with the heat off for 4 minutes. 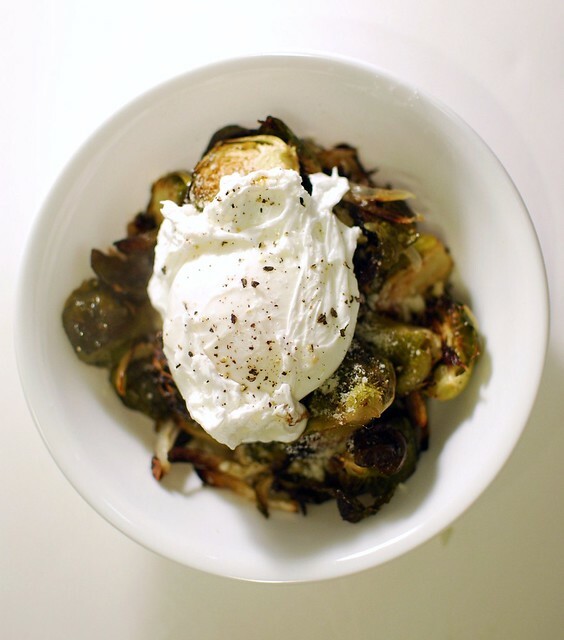 Remove with a spoon and place on top of the Brussels sprouts, and serve immediately. If you need to cook more than one egg, cook them two at a time. 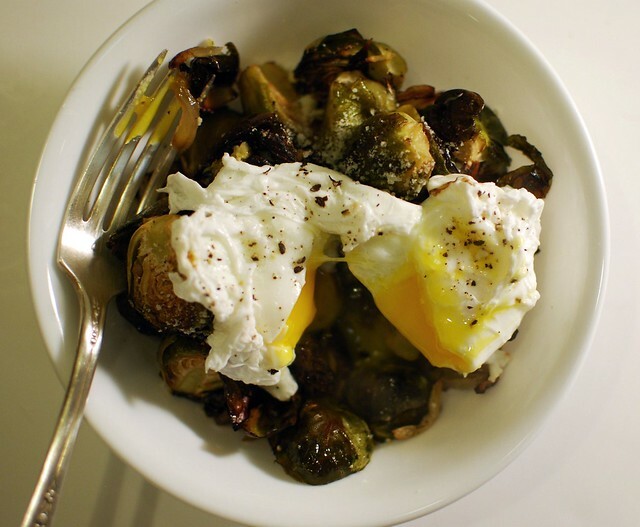 I am all about some veggies topped with a poached egg. Yum! I eat just about everything... except I have never really been fond of brussels sprouts. I never would have thought about roasting them. And I loved poached eggs, so anything could lie beneath! It was the picture that got me before I saw that they were brussels sprouts, but with the unique preparation, you did such a great job on convincing me that I will have to try this the next time I see brussels sprouts in the store!